Triobet is a popular operator of online casino games, poker and sportsbetting. Triobet offers a wide range of top-level online games, such as traditional table games and slots. 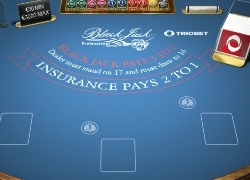 It also offers an exciting live casino where players can enjoy the real casino experience. Triobet welcomes new players with 10 free spins. Triobet is licensed and regulated by Malta’s Lotteries and Gaming Authority (LGA). This permits Triobet to offer online casino games. Triobet identifies security and fair play as its highest priorities. A player at Triobet can rest assured that their deposits are afforded the maximum security possible. Playing at Triobet is a great experience. You can play just for fun or for real money. It offers a wide range of online casino games which you can play directly on the website itself. No software’s required. Because of the clear navigation, new and existing players will quickly find what they are looking for. Casino welcome bonus 100% up to €100 + 10 free spins New players receive a 100% first-deposit bonus, plus 10 free spins for the video slot Devil’s Delight. Live Dealer Casino bonus 25% bonus up to €50 First-deposit bonus at the Live Dealer Casino. Poker welcome bonus €25 instant bonus + 30% Rakeback, or 100% bonus up to €1,000 + 30% Rakeback First-deposit bonus for poker. Players can choose which offer they prefer. Sportsbetting bonus 100% up to €50 First deposit bonus for sportsbetting. Triobet also offers a live dealer casino, where you can play live blackjack, roulette or baccarat with real dealers. There’s no software required, so you can play instantly once you have registered. You can also enjoy Triobet on smartphone or tablet. For now, you can only use the mobile version for sportsbetting. However, soon you’ll be able to play your favorite casino games as well. Live chat Ask questions directly through live chat. Open daily between 11:00 and 18:00. E-mail Submit your queries through the contact form on the website from Monday to Sunday between 09:00–05:00 hours. When you want to withdraw money, the minimum amount is €15 per transaction. Whenever a payment is requested, the money will be available on your account within three working days.